House Arrest is a group exhibition where artists intentionally challenge assumptions about the comforts of home. Works feature everything from Corin Hewitt’s disquieting still life photographs to Elizabeth Demaray’s upholstered rubble couch to Martha Rosler’s politically charged collages. The result is a crosscurrent of alternative meanings and meanderings that flip the domestic on its head, exploring the complex relationships between daily life and everyday objects. 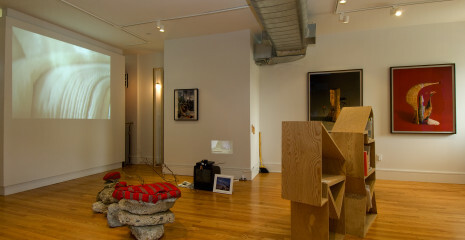 The exhibition is on view April 5 – June 10, 2012. A free public reception will be held April 5 from 5:00 – 8:00 pm. House Arrest is curated by Terri C Smith whose approach to the installation will significantly alter the physical qualities of the space’s three galleries, creating living rooms of artworks that are informed by the history of Franklin Street Works’ Victorian row house buildings — originally working class homes –as well as the makeshift domestic situations at recent political protest sites such as Occupy Wall Street’s Zuccotti Park. Participating artists are: Hector Arce-Espasas, Francis Cape, Alex Da Corte, Elizabeth Demaray, Stuart Elster, Marley Freeman, Jared Haug, Nate Heiges, Sean Hemmerle, Corin Hewitt, Rachel Higgins, David Horvitz, Jessica Jackson Hutchins, Justine Kurland, ROLU, Martha Rosler, Heather Rowe, Penelope Umbrico, Se Young, and Helen Zajkowski. House Arrest also features a curated shop and zine by Talisein and original publications curated by David Horvitz in collaboration with several independent publishers: andreview, Dominica, Fillip, and Triple Canopy. The exhibition features a PDF catalog that includes an interview on curating with ordinary objects between Taliesin and Bodhi Landa, an exhibition essay by Terri C Smith and Lisa A Porter’s essay on Zuccotti Park from a material culture perspective. Hector Arce-Espasas, Francis Cape, Alex Da Corte, Elizabeth Demaray, Stuart Elster, Marley Freeman, Jared Haug, Nate Heiges, Sean Hemmerle, Corin Hewitt, Rachel Higgins, David Horvitz, Jessica Jackson Hutchins, Justine Kurland, ROLU, Martha Rosler, Heather Rowe, Penelope Umbrico, Se Young, and Helen Zajkowski.